As many of you know we purchased a fixer-upper last year and completely remodeled the inside. It totally consumed us and we had little time/money leftover for the outside. Now that spring is here again we’re starting to focus more on landscaping and curb appeal. It’s crazy how much landscaping costs, especially when you have to start from scratch like we do, but I’ve managed to create some great curb appeal around our place without spending too much money. Here’re a few quick and frugal things that I’ve done or want to do to spruce up the outside of our home without busting our budget. Things like hostas and bulbs need to be dug up and separated every so often. Ask family and friends if they have any to spare and you just may end up with free plants. My mother-in-law called a few weeks ago and asked if I wanted any spring bulbs which I of course said YES! We planted a ton of daffodils, hyacinth and lilies at no cost to us. Also, if you see a plant or bush that you like ask the owner if you can have a cutting which can be rooted and planted as a new plant. Items such as wooden crates, metal tins, old tubs, etc. 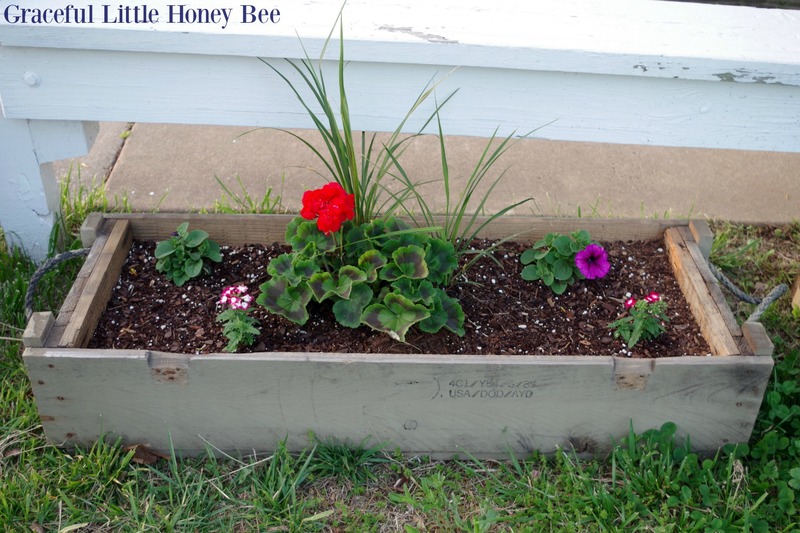 are great for creating charming planters without spending much, if any money. Look for unique items around your house or at junk sales. My husband brought home two wooden gun boxes from work that we turned into rustic planters. I love how they look and it only cost the price of the soil and flowers. An easy way to refresh your curb appeal is to add inexpensive seasonal pops of color. This includes things like doormats, pots, wreaths, etc. I found my wreath on clearance at Hobby Lobby for over 60% off. Also, I picked up a new door mat at Target for only $12.99 which adds another pop of color and makes a statement. Giving your house numbers a fresh look is inexpensive and can make a big difference. Consider repainting the ones you have or updating them for a more modern look. Go here for tons of creative ideas. 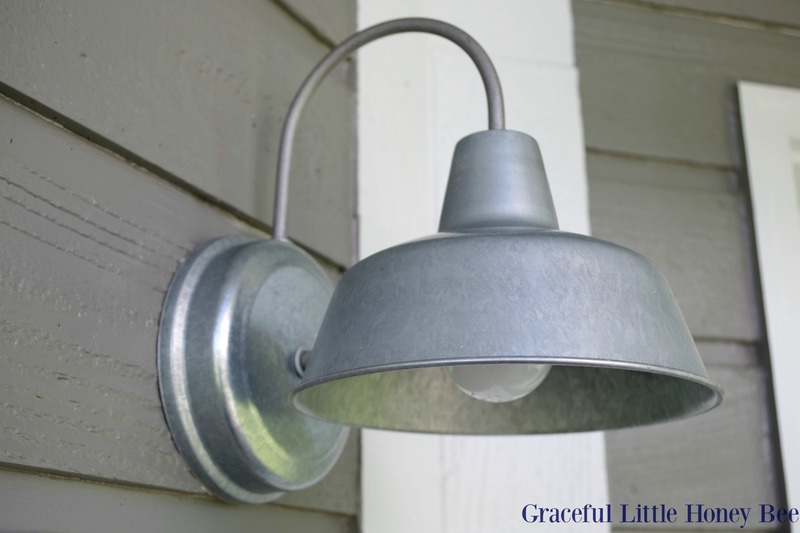 Lighting is another relatively inexpensive way to update the outside of your home. Consider repainting the lighting you already have or purchasing new lighting for a fresh look. 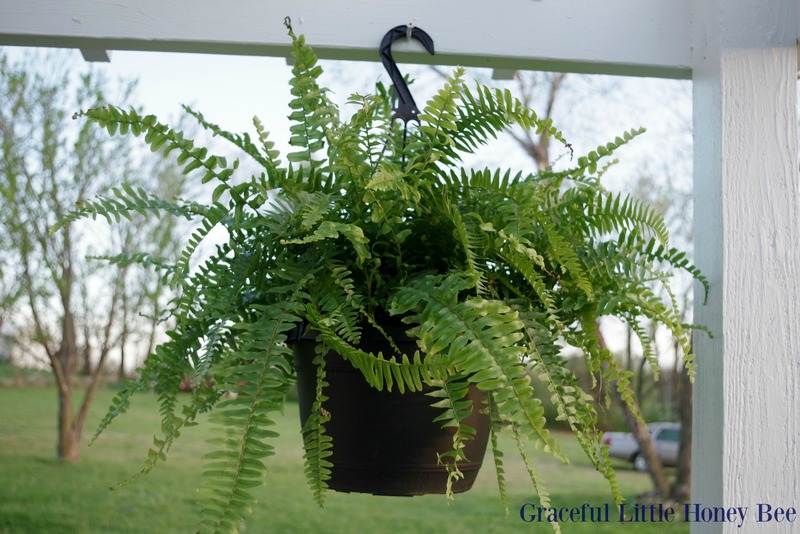 You can pick up hanging plants in the spring or summer for around $10 each and with care they will last through the fall. Ferns or geraniums are my favorite. 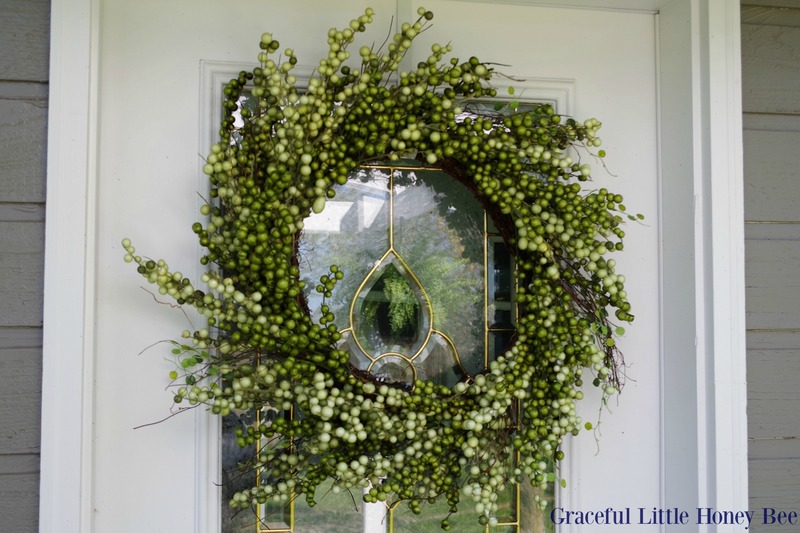 They really add a nice touch to any front porch without spending a lot money. This is on my list of to dos because I know it will make a statement without much effort. Consider making your own and painting them for a pop of color. Go here for a free tutorial. There’s something to be said about a good scrubbing. Sweep your porch, maintain your flower beds, power wash your house and clean your patio furniture for a fresh and tidy look without spending any money. 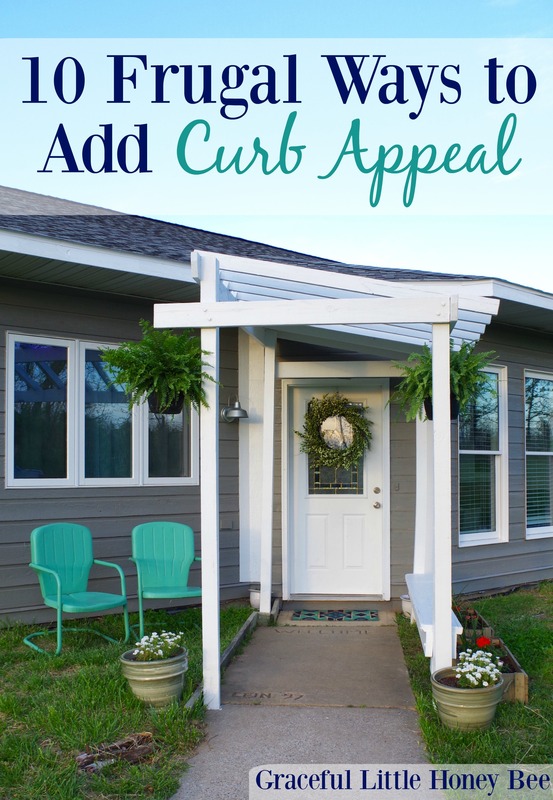 Adding a fresh coat of paint to your front door is a great way to add curb appeal without spending much money. I would love to get a new door one day, but in the mean time keeping a fresh coat of paint on the one that I have does wonders. Check your local nursery or home improvement stores for sales or end of season clearance. Sometimes nurseries will have a marked down section of plants that look less than stellar, but with a little water and attention will look good as new in no time. Also, consider waiting until the end of the growing season to purchase trees or plants as this is when most places want to get rid of their stock for the winter months. Last fall we bought several strawberry plants and ornamental grasses for only $1 and $3 each. Do you any ideas to add? I’d love to know! All wonderful ideas! I added some flowers around my mailbox and it made the world of a difference.